Know, O Brother mine, that where a truly spiritual love seeks to consolidate itself doubly by a pure, permanent union of the two, in its earthly sense, it commits no sin, no crime in the eyes of the great Ain-Soph, for it is but the divine repetition of the Male and Female Principles-the microcosmal reflection of the first condition of Creation. On such a union angels may well smile! But they are rare, Brother mine, and can only be created under the wise and loving supervision of the Lodge, in order that the sons and daughters of clay might not be utterly degenerated, and the Divine Love of the Inhabitants of Higher Spheres (Angels) towards the daughters of Adam be repeated. But even such must suffer, before they are rewarded. Man's Atma may remain pure and as highly spiritual while it is united with its material body; why should not two souls in two bodies remain as pure and uncontaminated notwithstanding the earthly passing union of the latter two. In the Phaedrus, Plato describes a three-level cosmos composed of a supreme reality, a world of gods and a world of souls. The inferior levels look to the higher levels for sustenance. The gods look to Reality, the souls look to the gods and have a less direct view of reality. Redemption is ultimately based on judgement and atonement according the merit of one’s actions and behaviour. Plato considers that the philosophical life is the ideal path to redemption. He introduces the role of beauty along with the notion of divine madness. The beauty that one sees in the beloved creates an intense feeling of inspired frenzy. This divine madness of lovers is considered to be the fourth and greatest type of madness. It provokes a recollection of the original vision of essential truths of the soul in the heavens. He describes the original vision of divine beauty as one of the brightest visions in the celestial world in lyrical, mystical tones. He relates the process of recollection to the mother of the muses. Beauty is described as being the most vividly manifested of essential principles and is particularly striking because it appeals to our visual sense, considered to be the brightest and sharpest of our senses. Plato however observes that the sight of beauty is like a double-edged sword. If experienced with modesty and restraint, it is a deeply uplifting experience. Without those sanctifying virtues it can lead to a debased carnality and crude sensuality. It is this moral challenge of beauty that the speech is essentially concerned with. The image of the charioteer and the two horses, a noble one and an unruly one, are introduced corresponding to the rational, spirited and sensual divisions of the soul in the Republic. In Freudian terms, the struggle to control the unruly horse in the sight of beauty could be described as a process of sublimating the energies of the libido (instincts and unconscious energies) through a proper repression in order to develop a socially functional adult behaviour. In summary, Plato uses the image of the charioteer and the two horses at a cosmic level for ontological purposes. The charioteer participating in the divine revolutions denotes the soul’s metaphysical nature. The fall of the soul deals with the problem of the origins of human incarnation and the origins of human consciousness. It serves to evoke why human beings have the capacity for reason and understanding, distinguishing them from animals, despite having an animal nature. When the soul suffers incarnation in a body, Plato pursues the charioteer image to develop on the epistemological, psychological and ethical aspects of the human condition. 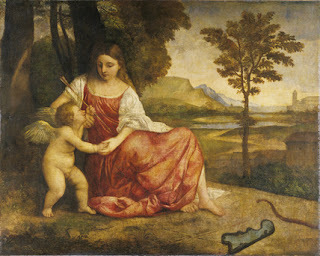 Plato concludes the myth by discussing three paths that a loving relationship can take: one lived in chaste purity and virtue leads to salvation, regaining one’s wings; a life of virtue inspired by love, but with occasional lapses into physical passion, leads to a slower, partial redemption; a relationship characterized by seduction and calculation is not conducive to salvation. The loss and re-growth of wings deals with the intellectual faculties of the soul. The loss symbolizing forgetfulness and ignorance and the re-growth denoting progress in recollection and knowledge. “These, in sum, are innocent frequenters of beauty, not to be confused with the class to whom it becomes an occasion of fall into the ugly – for the aspiration towards a good degenerates into an evil often” (Plotinus, III, 5, 1). 2]We have defined the concept of ‘‘libido’’ as a quantitatively variable force which could serve as a measure of processes and transformations occurring in the field of sexual excitation. We distinguish this libido in respect of its special origin from the energy which must be supposed to underlie mental processes in general, and we also thus attribute a qualitative character to it (Sanford 54); Socrates’ speech identifies (contra Halperin) a metaphysical desire for immortality shared by all animals,including the human. Even intellectual procreation in the more abstract forms of beauty is described in ecstatic terms. Eros, in all its manifestations, is neither somatic nor psychical, neither ‘‘sexual’’ nor ‘‘non-sexual,’’ but both"(Sanford 56).